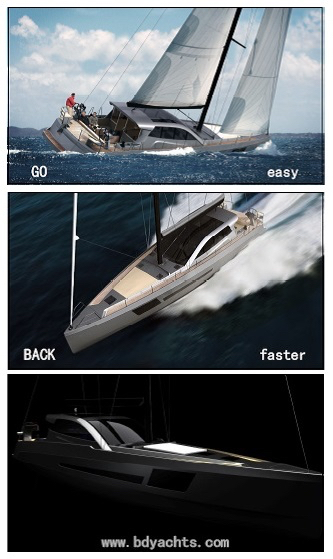 The main objective pursued by the boats of BD Yachts is the design and development of innovative and hybrid vessels aimed at recreational sailing, providing the advantages of the motor boats, which can reach a speed of up to 20 knots; and adapting to a sailing boat, where it is expected to achieve a cruising speed of up to 9 knots and a maximum sailing speed. There are currently no vessels with these characteristics, so, using the latest technologies we intend to design and create mixed products that are attractive and also accomplish with the navigation requirements the market is looking for. The innovative design of the naval architecture that allows to reach high speeds and benefits to both sailing and motor, is the result of the experiences gathered in the design of high-performance boats that have been tested in the regattas of recent years. The motorization in reliable systems and of little weight like the propulsion of outboard motors with great power, that did not exist few years ago. The carbon fiber technology, necessary for some elements that, in addition to resistant, must be flexible to the impacts of the sea that the high speeds can generate, were not available for the serial production market. The great tests carried out without the need to manufacture prototypes for their improvement, thanks to the use of CFD (Computer Fluids Dinamycs) technology, which allows to test the boats through computer simulations with results as if they were real. A system for high-speed sailing boats such as the Volvo Ocean Race or America’s Cup.